by Fr. Joe Whalen, M.S. I was born in Quincy, Massachusetts, on July 14, 1923, the eldest of seven boys. My mother’s brother was a bishop who, when I was 13, asked me to study for the priesthood. I was very young and indecisive and really didn’t know what I wanted to do, so I refused his generous offer. My father was a carpenter and out of work a great deal during the Depression years, so, when I was 12, I started working odd jobs to earn money to help him. I did whatever I could do. In the winter I sold Christmas trees and shoveled snow, and in the summer I cut lawns and dug clams. When my six younger brothers came of age, they worked also. Every summer I collected a considerable amount of money that enabled me to buy my own clothes for school. My grandmother lived with us until she went to heaven at the age of 94. She used to have some old silk stockings with runs in them into which she’d stuff our hard earned dollar bills. Our names were on the stockings and whatever money we gave her, she’d slip into the right slot, so to speak. Soon after that I went down on a sea wall one night with a gang of kids my own age. I held back some of the money I made digging clams and didn’t turn it into my grandmother. We pitched in and had the local drunk go to the package store to buy us a quart of whiskey, and we sat on the stone wall and drank it straight out of the bottle, wiping the top of the bottle off while passing it around. I had my first drunk that night and, to this day, some fifty-five years later, I still remember it. My head started spinning. I threw up. I blacked out. I don’t remember how I got from the stone wall to the vacant lot next to my house, a quarter of a mile away. My family had the police out looking fr me while I slept in the weeds. I awakened when the sun came up, around 5:00 AM with the dry heaves and a splitting headache. I snuck into the house and tiptoed up to the attic bedroom, where three of us slept in one bed. I was thirteen and an alcoholic. The alcoholic drinking continued. It seemed like I had to get half-loaded in order to work up the courage to do normal things, like asking a girl to dance. Temporarily, I’d feel like the king of the hill, but as the booze wore off, I’d feel miserable and have a lot of guilt feelings, always figuring that I was a loser. I daydreamed my way through Quincy High School taking every fresh air course possible. I didn’t know what I wanted to do with my life. 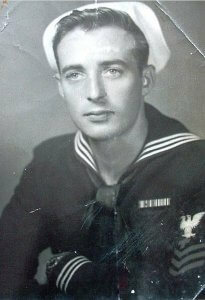 I turned 18 and graduated, then joined the Navy where I spent the next three years and three months, during World War II. I became a 1st class Pharmacist’s Mate. During the war years, there weren’t enough doctors to go around for all the smaller ships, so they used Pharmacist’s Mates 2nd class and above, in their place. I worked my way up from apprentice seaman to be in charge of the health and welfare of 27 crew members on board a submarine chaser. These were wooden hulled ships (aka “The Splinter Fleet”)which laid smoke screens for our gunboats and chased enemy submarines all around the Mediterranean Sea. My drinking picked up. Whenever we had free time in any of the ports in Africa, Italy, Sicily, or France, I always went out with the gang and got drunk, not remembering how I’d get back. Sometimes I’d lose a shoe or my white uniform would be all dirty or torn. People would steal my wallet or wrist watch and, I’d be so out of it , I wouldn’t even realize it. The disease progressed. I didn’t know I was an alcoholic, I just figured that going out and getting drunk was the way of life for Navy seamen. In North Africa we’d go to a bar and drink cognac straight out of a cut-off Coke bottle. We’d wash it down with African beer, served in a cut-off top of an evaporated milk can with all the rust swimming around. We’d chug-a-lug that and get loaded. That stuff was so powerful it would ignite if you put a match to it. It could have been used for lighter fluid! It’s a wonder I had any stomach left after that. The more I drank, the more I became immune to it and the more I required. Prior to my overseas assignment, I studied at the Naval Hospital in Portsmouth, Virginia where I learned how to make cough medicine, officially known as elixir terpin hydrate with codeine. Instead of making cough medicine, I made instant gin with 190-proof alcohol. So if a patient came to me with a toothache or headache or appendicitis, I’d give him a big shot of my instant gin. He’d chug-a-lug it and go flying out of the sick bay! When I was sober, I felt miserable, and when I was drinking, I was living it up. I thought I was having a bang-up time indulging in wine, women and song. After the war ended, I went to work for the Moore MacCormack Steamship Lines where I got a job as a purser and earned extra pay for being a Pharmacist’s Mate. I now had a private stateroom in the officer’s quarters and could order from my own menu. I also upgraded my whiskeys to the better ones like John Jameson and Johnny Walker. Still drinking and not remembering a lot due to black-outs, I became a Jekyll and Hyde personality. One minute I’d be carefree and happy-go-lucky, and the next, obnoxious and foul mouthed. After this, I went to work for the Telephone Company, where, for the next 32 1/2 years, I worked my way up through the ranks to a seond level management position, an account executive in the marketing/sales department. When I left in 1982, I was earning $40,000 a year. I met Frances Vance at a dance at Mosely’s Ballroom in Dedham, Massachusetts, in 1947. We courted for a year and got married in October of 1948 and started raising a family. It took everything I had to hold down a job. I kept a maintenance level of booze in my system so that I would not get the DT’s. I began to leave work early because I started getting the shakes and needed a fix-a straight shot of whiskey with a beer chaser. Many a time I slept off a hangover on the banks of the Charles River overlooking MIT. I’d just sleep on a park bench with my suit and coat on, briefcase on my lap. I felt like a big zero. I had such an inferiority complex and hated myself. One of my kids would get sick or something would happen and I’d accuse God of punishing me, believing I deserved it. My marriage suffered and so did my kids. I tried to compensate for my behavior by buying them a nice house with lots of material things. We had three girls and two boys. Although I never laid a hand on my wife while I was drinking, I was really obnoxious and verbally abusive. My family repeatedly asked me to stop drinking. The more they told me about my drinking problem, the more I drank. I couldn’t stop. I had a disease and I didn’t know it. I’d start at 5 or 6 in the morning on the weekends, fill a water glass with whiskey and chase it with a couple of beers. I’d have a liquid breakfast, lunch and supper. Sometimes I wouldn’t eat for two or three days at a time. It was bad and not getting any better. I was what they called a high-bottom drunk; not one living in the weeds or in an empty car in a junk yard or a cardboard box, that’s the low bottom. It”s like an elevator. You can get off on whatever floor you want. I never did go way down into the depths, but I was heading that way. Underneath, I desperately wanted to do something about my drinking. I was told about a Franciscan priest, Fr. Henry, who supposedly could help people like myself. Whenever I went in search of him, he was never around. One day I walked into the lobby of the Franciscan monastery, and in a desperate attempt to find help, asked the first priest I saw, “Who knows anything about drinking too much booze?” “Fr. Henry,” he said without hesitation, who thankfully, was available to see me. Fr. Henry took me aside like a little kid and took out a piece of paper. He drew an escalator with arrows going up on one side and on the other, arrows going down. He said, “When you’re going down to destruction, the first thing that suffers is the spiritual part of you. After the spiritual comes the mental and then the physical. When we’re going up the escalator to recovery, we get well in the reverse order.” He said, at the rate I was going and the amount I was drinking, I’d be lucky if my liver didn’t explode. I could bleed to death internally or end up in an institution with a wet brain. To drink alcoholically is to ride on that down escalator which doesn’t stop until it reaches bottom. Fr. Henry reminded me that recovery reverses the process. When we stop drinking the first part to heal is the physical. Like a newborn, we can tolerate milk and baby food while our bodies repair. Slowly, we add solid food until we can handle steak and mashed potatoes. Then our mind kicks in because it starts to clear. My mind was like scrambled eggs. It took three months for the fog to lift before I could think a little clearly. And then, finally, the spiritual comes back. Until we get the spiritual back through a recovery program, we cannot expect good results. We’ll do the same old things and we’ll be nasty and irritable because we’ll be on a dry drunk. We’ll want to drink so badly but can’t because we know what it’s going to do to us. It’s like a three-legged stool. If you remove one of the legs, the stool will collapse. Same with us. In order for us to be a whole person, that is holy, the spiritual, mental and physical parts of us all have to work in harmony like a well oiled machine. Unless we incorporate the spiritual into our lives, we’re going to drink again. The point is, we must ask for help. Fr. Henry taught me to pray every morning. “Help me to stay away from drinking today,” and to thank God at night by saying only two words, “Thank you.” I don’t even have to use God’s name. God doesn’t expect long litanies. I walked out of my meeting with Fr. Henry on June 29, 1976, and haven’t had a drink since that meeting sixteen years ago. (36 years ago, as of this last printing in 2012.) That’s the feast day of Sts. Peter and Paul,, and I like to compare myself in a very small way to St. Paul and some of those other rowdy saints who had a major conversion! At night when I don’t drink, before I go to bed I just kneel down and say, “Thank You” It has worked for me for 36 years, so why try to reinvent the wheel? He didn’t lie to me. After five years of sobriety, Fr. Henry told me that it took him five years to get his head screwed on straight. When I met him he had been sober for 11 years and I remember being incredulous when he told me that he was an alcoholic. “What are you talking about?” I protested, “You don’t look like one!” I thought alcoholics had to be falling down down drunk. He told me he was a sober alcoholic, that it is an incurable disease. If I took one drink, I’d be off and running again. A thousand isn’t enough and one is too many! I can never take another drink, period. It was too late to save my marriage. Frances was fed up with me and after 34 years of marriage, she took me to court and had me remove from the house. The court ordered the house sold. “How could this happen?” I asked myself over and over again. “Was I that bad?” I resented my wife for what she did. I could see all my possessions going up in smoke, a whole life’s work. I was $15,000 dollars in debt. In typically alcoholic behavior, I paid back most of my debts in one day, compulsively using the proceeds from my share of the sale of the house. But the most painful struggle I had, was to be rejected by my children. Of my five children, only my eldest son Mark, had anything to do with me. I moved into a small apartment in Dorcester and, for the next five years, struggled to reconstruct my life and stay sober. My sobriety saved me from burning to death in my apartment. I awakened one night out of a sound sleep and stared into what looked like the core of the sun. Groggy from sleep, I wondered for a second if I was in another world! Then I realized that the house was on fire. My bedroom was tucked into the back of the building and I had come within seconds of burning to death and becoming ashes on the bed springs. I woke up because I was sober. Fr. 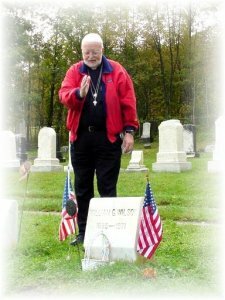 Joe praying over Bill Wilson’s grave, co-founder of A.A. (Alcoholics Anonymous) in Dorset VT many years later. One of my sponsors at A.A., Dr. Frank D. often spouted pearls of wisdom that impressed me so much. I’d challenge him to tell me where he learned them. His response was always, “In the Bible, dummy!” I hardly even knew what a Bible looked like, but Dr. Frank D. whetted my appetite enough for me to open it one day. When I did, I couldn’t stop reading it. Typical alcoholic. I’d come home from the Telephone Company, rip the tie off throw the briefcase and suit coat on the couch and sit back and read for six or or seven hours. I gave up television, football games, often skipping dinner in order to continue reading. Night after night, I had a hunger and a determination to keep reading. I read the Bible through from the first sentence in Genesis to the last sentence in the Book of Revelation. Then I read about 50 lives of different saints. What uplifting stories! I loved them all. I also became fascinated with angels, and read all about them, developing a special devotion to my guardian angel and the Archangel St. Raphael. One day, I grabbed a book that was being discarded on St. Thomas Aquinas, his Summa Theologica. I read every treatise and took 450 pages of hand written notes on everything that I read. Another of my sponsors, Chuck C. kept after me to consider religious life. He wanted me to become a LaSalette Missionary. He saw something in me that I didn’t see! 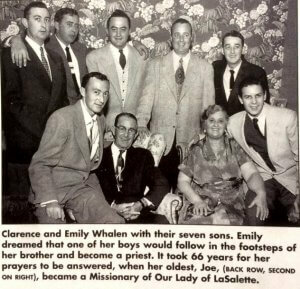 He was studying to become a LaSalette Brother, but then, his life took a different turn because he left and later married. The Lord was planting seeds and putting people in my path to steer me to the priesthood. A woman mystic, Annie F., whom I met, introduced me to Sister Mary Michael, a cloistered nun who belonged to the community of the Precious Blood Monastery in Manchester, New Hampshire, for 50 years. She said, “Joseph, I see you as a priest.” All I could think of was how unworthy I was. I said, “No, don’t talk like that, that’s ridiculous, I’m a no good loser alcoholic.” She insisted and told me she could visualize Jesus pardoning me for my past sins and opening the skies to let my mother peek down to see my ordination and me saying my first mass a my hometown church, Blessed Sacrament, in Hough’s Neck, Quincy, Massachusetts. With tears rolling down my cheeks, I thanked her. I knew then that I had a calling. Insurmountable obstacles seemed to stand in my way of becoming a priest. First, I never thought I would be able to get an annulment after 34 years of marriage. that one problem alone was enough to deter me from even thinking about it. I still owed some of the $15,000 incurred from expenses in the last year or two of my marriage. Because of my drinking and irresponsible lifestyle, I had lost financial control of myself and my family. No missionary order would accept me with those debts. Even if I cleared those up, I thought no one would accept me at age 60, and even if they did, I only had a high school education. If God wanted me to be a priest, He would have to clear the path Himself by removing these obstacles. Through the unconditional love of God, who’s forgiveness, mercy and patience is mind boggling, all these insurmountable obstacles were removed, one by one! Nothing is impossible to God! One night, I began to have a series of inner visions when I went to bed that lasted for about seven months. With my eyes closed, I’d first see a pinpoint of brilliant light with a bluish tint opening up on the screen of my soul, so to speak. Then I’d see a beautiful white dove flying toward me. It made me cry. Several times, I saw Jesus suspended from a dazzling white cross. These visions were like inner technicolor movies. Another time, I saw a heart wrapped with thorns, pulsating with blood; then I saw two hearts with thorns wrapped around the both of them. “Jesus, is that You? What do you want me to do?” I’d ask. There was no response, but I was overcome with tears and filled with joy to think that a loving God would think so much of this obnoxious drunk to draw me to a life of more fulfillment in the spiritual realm. One of the last visions I had was of the white dove coming toward me accompanied by two angels who were suspended in the air. When I asked my spiritual director about these visions, he told me to accept them with gratitude, but not to look for them. God was sending them as consolations, to get me to the priesthood! God was speaking to me directly, through the Bible, for the first time in my life.This was a new, overwhelming and and joyful experience for me. If I had known that night, what I know now, I would have gotten up from bed and read 1 Corinthians, chapter 1, verse 26 through 31. Then I could have gotten a good nights sleep. Nobody believed me. “You’re nuts!” they’d say, but I knew for sure. And besides, hadn’t I been preparing without knowing I was studying for the priesthood? My Bible reading and spiritual studies gave me a good foundation for the philosophy and theology requirements I’d have to take. The past was being cleared for me and one by one. God was removing the obstacles that stood in my way of accepting His call. The first was my marriage. I had been consulting with a Franciscan priest who was a psychologist. He really believed I had a case for an annulment and so I went through the long process. Annulments are granted on the basis of psychogical impediments that exist before the marriage. Due to my immaturity and drinking, I wasn’t capable of sustaining a relationship. On my wedding day I had to have two or three water glassed of booze just to get down the aisle. Many times, I remember I had to stand in the back of church ready to dash out the door. I’d start shaking all over and have to wrap my arms around a telephone pole or a parking meter. I thought I was having a heart attack. Based on this data and on other considerations including letters validating my alcoholism and immaturity, I was granted an annulment. I entered Pope John XXIII Seminary, a seminary for delayed vocations, and got through four years of advanced graduate studies. 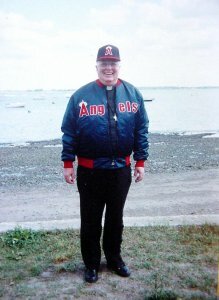 On January 28, 1989, I was ordained a deacon at the Cathedral of Holy Cross in Boston by Cardinal Bernard Law. Then on September 9, 1989, I was ordained a Roman Catholic priest by Bishop Alfred Hughes and became a LaSalette Missionary. I was 66 years old and never happier! People would ask me what my former wife and kids thought about my becoming a priest. Mark was the only one of my children who spoke to me. The four others never contacted me. When I was kicked out of the house and living alone in an apartment, I cried for seven months straight over the loss of my children. I suffered for the hurts I caused them and wished, with all my heart, to be reunited with them. I turned them over to the Lord. The Lord waited 66 years for me to become a priest and if necessary, He’s so loving and patient, He will wait another 66 ears for them to accept me. I carried them in my heart and prayed for them everyday, remembering them in every one of my Masses. My former wife and I talked once in a while. She told me she that she loved me and that despite everything, I was always a good father to the kids. He certainly did with my life. I have a ministry of reconciliation and I am in a position to help people with family problems and alcoholism because of my own background. All things do work together for the good of those who love God! The Greeks called this “kenosis,” which means emptying out. Our kind and merciful Savior, Jesus Christ, emptied Himself out and took all the sins of the world on His shoulders, suffered on the cross and died in agony to save us from our sins and redeem us. That was kenosis, the fact that He emptied Himself out and lowered Himself to take on human flesh through the Blessed Virgin. That’s the conversion process, emptying ourselves of our sins so we can be filled with the healing love of God. This is what I did, through the grace of God, and the Father glorified it. Kenosis is a daily thing. We can’t live on yesterday’s sobriety, because we’re broken from the fall of Adam and Eve and original sin. We need to be renewed and healed every single day. I’m living a full life, meeting beauiful people and helping to build up the body of Christ. I’ve never been happier. I know God’s using me. I know He wants me to witness to the world that we cannot do it on our own. We think we’re so strong and we say, “I don’t need anybody to help me. I can handle anything.” It’s not true. We can’t do it by ourselves. We need Jesus Christ to help us. There aren’t enough words in the human language to describe the beauty and love and the kind, tender, all-forgiving, all-healing, all-powerful, all-glorious Jesus Christ our Savior. The human language can’t give Him the credit and glory and honor that He richly deserves. Sometimes I get so filled with the Spirit I feel a glow inside and want to smile and reach out to others to try to help them. I started an A.A. meeting with Lenny “B” in St. James Church in Danielson, Connecticut, and a charismatic prayer group with some leaders of our parish. There were so many people hurting and in need there, crying for spiritual help. They said to me, “Our prayers have been answered. We’ve been waiting for you, Fr. 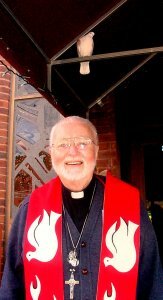 Whalen.” I’ve been ordained a little over two years and I praise and thank Almighty God for directing me on this path and for bringing my friend Paul R. into my life. He’s been an inspiration to me as well. “Fr. Joe Whalen was ordained a priest yesterday and celebrates his first Mass this afternoon at Blessed Sacrament Church in Quincy. Whalen is what Catholics refer to as a late vocation. His life has had more turns then the Indianapolis 500 but he’s a strong guy, the last tree standing in a hurricane, and he has been an inspiration to a lot of people. The pace did not let up since Fr. 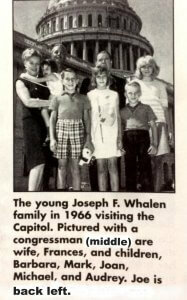 Joe came to St. James Parish in Danielson, Connecticut in 1991. Thank God! If one had followed Fr. Joe in his daily routine, one would have found themselves exhausted. His days were full and his ministries were many. His day would start off with daily Mass at St. James Church. He visited the sick at a hospital in a nearby town he also celebrated Mass at two convalescent homes and five elderly housing developments every month. The parishioners of St. James were blessed with exposition of the Blessed Sacrament once a month. Every third Tuesday, Fr. Joe heard confessions at 6:30 pm. At the close of the Sacrament of Reconciliation, Mass was celebrated followed by a healing service. 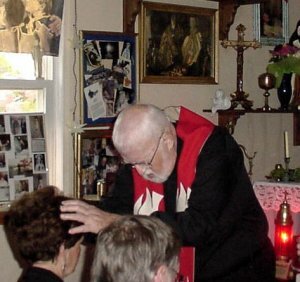 Saturday afternoons at 3:30 pm he would hear confessions and once a month he dedicated an afternoon to the Sisters of the Daughters of the Holy Spirit in Putnam, Connecticut as their Confessor. The Sacrament of Reconciliation is the charism of the La Salette Missionaries. In between all this were telephone calls, ministering to the dying, counseling and his special healing ministry of St. Raphael. This ministry became known worldwide during the 1990’s. He often spoke at A.A. and Alanon meetings. Being Chaplin for the Knights of Columbus and the Daughters of Isabella were also part of his schedule. Fr. 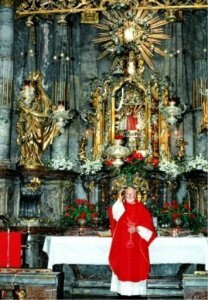 Joe’s role as Spiritual Director on pilgrimages to the Holy Land, Infant Jesus of Prague, Czech Republic, Betania, Venuzuela, Medjugorje, and other Marian shrines sites in France and Italy were appreciated by many. Fr. 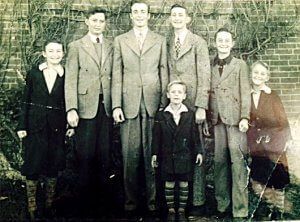 Joe (third from left) was the oldest of seven boys. All predeceased him by the age of 70. He did all of their funeral Masses. “Our Lady of La Salette” changed Fr. Joe’s alcoholic drinking to non-alcoholic drinking and then on to the Priesthood. God chose the death of his wife, Frances, as a way to be reconciled with his five children and his twelve grandchildren through the power of prayer. He has also baptized seven of twelve grandchildren. God does write straight with crooked lines. With Almighty God’s help, Fr. Joe continues to work hard to reach his full potential and win as many souls for God as he can on his earthly journey. As of this third writing we are in the year 2012. Fr. 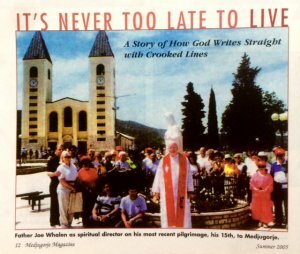 Joe was ordained at the age of 66 on September 9th 1989; this year on September 9th he will celebrate his twenty third year in the priesthood! He will turn 89 years old, this July 14th (Feast day of Bl. Kateri Tekawitha). He has had a long devotion to Bl. Kateri and has prayed for her intercession on many occasions. One of his prayers, God willing, has been to live to see her elevated to sainthood. 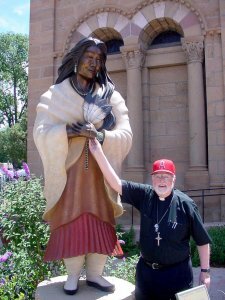 On December 19, 2011, the Holy Father signed a decree acknowledging a miracle attributed to the intervention of Blessed Kateri Tekakwitha, (1656-1680) the first native North American to be raised to sainthood. She will be canonized on October 21, 2012. A great blessing indeed! Although his daily duties at the parish have slowed down, his traveling ministry has remained very active and busy. He has traveled worldwide conducting many Masses and healing services and continues to do so. With the charism of healing his ministries are many and he is a champion of the sick, the elderly, drug addicts, alcoholics, and families. Raphael, and his “Archangel St. Raphael Holy Healing Ministry” is international. Many spiritual conversions and physical healings have been the fruits of this powerful ministry. Fr. Joe takes no credit, and always stresses he is only a humble instrument of God, only Jesus Christ is the Divine Physician and healer. (On right is Fr. 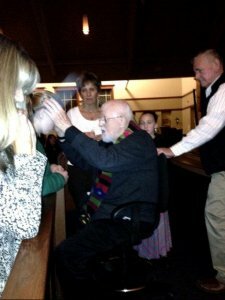 Joe, 91, with miraculous light over his hands as he prays over girl.) He still answers all his mail and telephone correspondence. 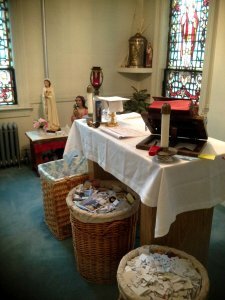 He has three huge baskets of prayer requests under the altar in the rectory priest’s chapel. He prays over these baskets daily that the Lord will heal all these people. 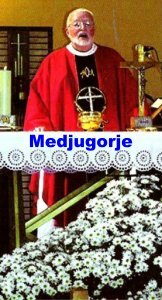 At his healing services he is noted for praying over each person individually many times these services last for hours. Every person is special to him and he has a unique way of showing God’s love for that person. charism of the La Salette is Reconciliation … compassion and mercy to the repentant. He is noted for his charismatic gifts and his ability to hear confessions for hours. His talks have captivated countless numbers of Catholics. 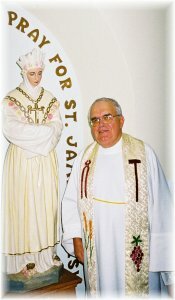 He celebrated his 50th Jubilee on September 19, 2010 on the Feast of Our Lady of La Salette. If signs and wonders are any measure of God’s approval, we would have to say that even God approved of this Lenten Retreat with Holy Mass followed by a Healing Service. Beginning in the morning a beautiful dove appeared and perched over the front entrance of the church. Over three hundred people went in and out of the entrance all day and the dove never left his perch. While we were inside, the dove turned his entire body and watched us through the window over the entrance doors and at 5:15 pm, just before we were finished, he was still there! Rev. 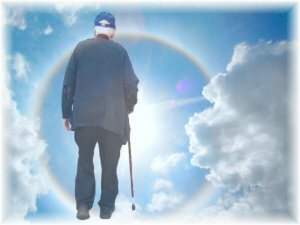 Joseph F. Whalen, M.S., 93, died August 8th, 2016 in Hartford, Connecticut. He was always willing to help his family and friends with any problem. He was heard many times saying, “There are no such thing as strangers, only friends you haven’t met!” Each and every person was special to him and he had a unique way of showing God’s love for that person. He was noted for his ability to hear confessions hour after hour. He was the founder of the St. Raphael Healing Ministry and traveled world wide conducting many Masses and healing services. His ministries were many and he was always a champion of the sick, the elderly, drug addicts, alcoholics and families. He retired at the age of 91. Many people come and go in our lives, but very few make a worthwhile, memorable impression, like Fr. Joe. His humility, integrity, hard work and jovial spirit will continue to inspire those who knew him to love God, be kind to your neighbor and never give up hope. Fr. Joe will be sorely missed, both by his family, colleagues and by his many friends, whom he helped and inspired. 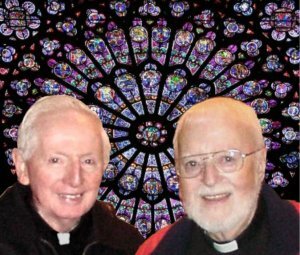 But as he has earned his eternal rest from this life, this priest, father, and friend should know the world is most definitely a better place because of his good works and kindness for others. His life is a story of “How God writes straight with crooked lines!” Fr. Whalen spent his entire priesthood witnessing Jesus Christ’s healing love and helping countless people find hope in the midst of life’s many challenges. Fr. 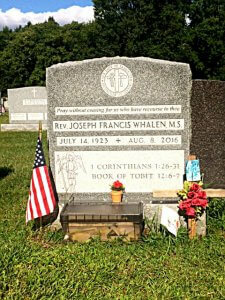 Joe Whalen’s grave, St.Francis Xavier Church Winooski, Vermont. In death as in life he always had a prayer basket of people to pray and intercede for. Many pilgrimage to his grave to ask for prayers. 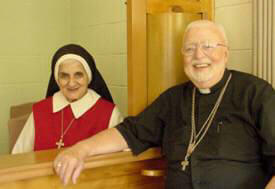 His legacy and love for the St. Raphael Ministry that he founded will continue. We now have a powerful intercessor in Heaven!